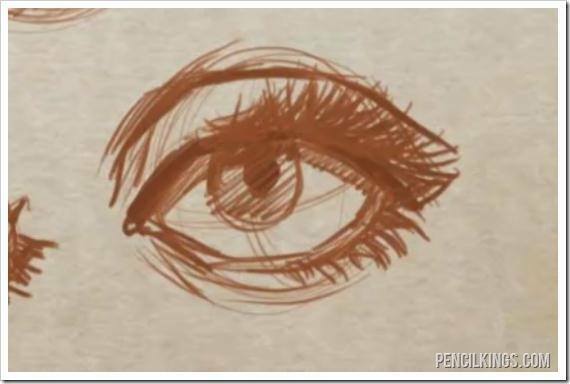 how to draw an eye and add eyelids and eyelashes. Want to learn how to draw an eye? Now you’ve got an understanding of how the ball shape of the eye works and that it’s a real three dimensional object, it’s time to take a look at some of the other elements. 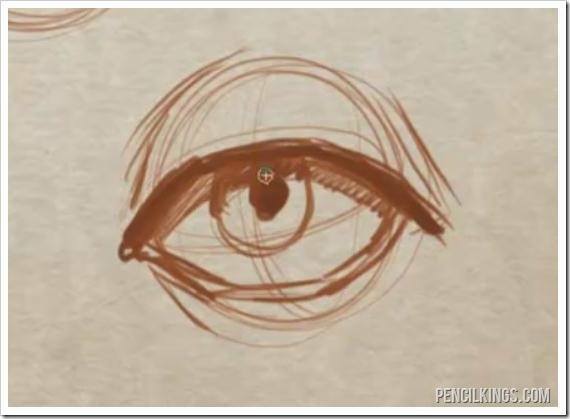 When you are drawing the eyelids over the top of the eyes, you also need to think of these lines as stretching over top of the surface of that ball. It’s a good idea to look at how the eyelids work from the side view as well as from the front. Doing this will deepen your understanding of the thickness of the lids and how they curve over the top of the eyeball. Because of the thickness of the eyelids, it’s good to draw them with a double line so this thickness is apparent. The upper lid slightly overlaps the lower lid on the outside of the eye. Always remember to keep in mind how these lids are travelling over the surface of the eyeball. When you are just starting out here, it may be a good idea to find some reference photos that focus just on the eye, without the rest of the face. By focusing on just one feature you won’t be distracted by the other parts of the face. And, you’ll be able to better evaluate the different parts of the eye and see what is really there instead of your brain tricking you into seeing things that aren’t there. When you begin to shade your eyes, the thickness of the upper lid will almost always fall into shadow. How come? It’s because, as humans, we are often in a situation where there is overhead lighting – be it from the sun, or from a light bulb on the ceiling of the room your character is sitting in. The thickness of the upper lid also causes a shadow to appear on the eyeball below the point where the upper lid meets the eyeball. And, when learning how to draw an eye, this is a pretty useful tip to take on board. Here’s an example: What do you think would happen to the shading on the eye if the character was in a completely dark room with a flashlight that was pointed up at the face, instead of the usual overhead lighting? The eyelashes originate from the eyelids and fan outward. It’s a good time to take out the real eye photo reference that you collected in the last lesson so that you can look closely just at the eyelashes and try to figure them out in a way that makes sense to you. On the lower eyelid you will have shorter and fewer eyelashes. The exception to this rule is when you are drawing someone who is wearing eyeliner, mascara or fake eyelashes to artificially enhance the lower eyelashes. Do You Always Need to Draw the Eyelashes? No. Because we usually see (and draw) the eyes from a distance, it’s completely acceptable to draw the lashes all grouped together as one mass. 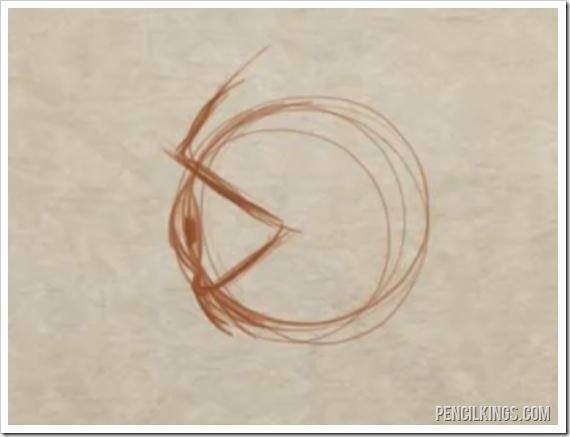 Who knew learning how to draw an eye could be this easy?Now, if you’re drawing portraits or large-scale drawings, you probably won’t want to use this method. But, if you’re drawing comic books, cartoons, or scenes of characters at a distance, then go right ahead! This example shows you a quick and efficient way to shade the eyelashes. That’s it for now – we hope this blog on how to draw an eye has cleared up any areas you weren’t sure about. Got any other tips for drawing eyes? Sharing is caring, so drop us a comment in the box below! 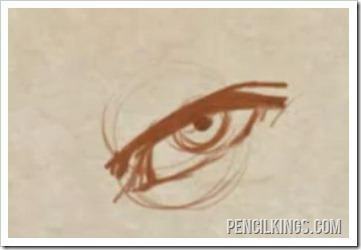 Want the Complete How to Draw an Eye Video Course?